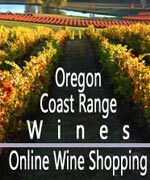 (Yachats, Oregon) – If you do it right, you can spend a good day exploring even one two- or three-mile stretch of the Oregon coast and never see it all. You'd be surprised at all the magnificent and awe-inspiring discoveries to be made, hiding in plain sight. This can be especially true of the Yachats area, even more so if you include the 20-mile stretch between there and Florence. 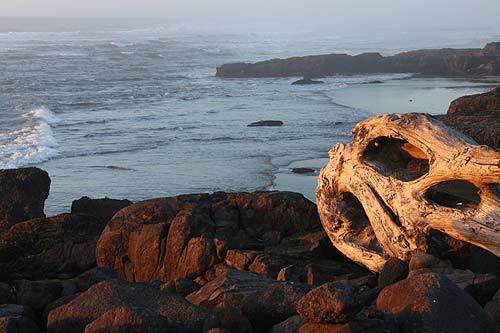 It's a section of Oregon coast full of wild finds, slightly hidden, but often jaw-dropping. Here are just eight of these wild and wacky sights. Three of them lurk in one small section of Strawberry Hill Wayside, about halfway between Yachats and Florence. You could even say one of these structures hosts yet another fourth wonder within it. This little out-of-the-way beach access is quite full of striking objects, but we'll only look at four. Head to the back northern corner of this cove-like beach and you'll start to see bundles of eye-popping details. First, there are these min-caves: really just large, slightly eye-shaped holes in the sandstone cliffs. 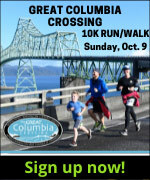 See the top photo. Even before you get there, however, you'll notice this odd blob sticking straight up in the air. 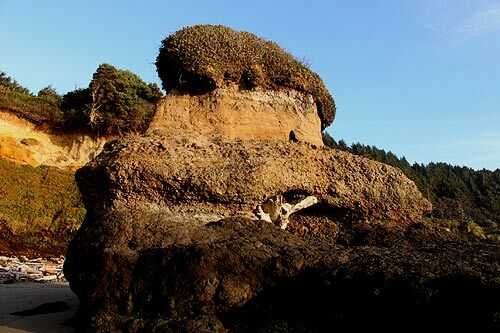 Like something out of Dr. Suess or a Yes album cover, it's more than a tad out of place, looking like almost no other feature on the whole of the Oregon coast. You can tell storms have lobbed objects at it, with at least one log jammed into it. Even more remarkable is what is behind this unique object. 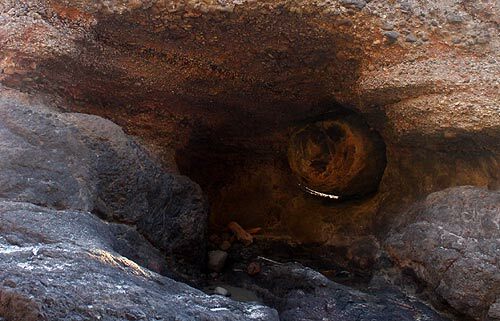 It appears as if a log is embedded in the rock itself, leading to questions about whether this is petrified wood, or even how on Earth did it get there in the first place. Much closer to the entrance of Strawberry Hill, if you look close, you'll see this wild little feature. It looks like steps are actually embedded in the basalt rock. Although, they are decidedly askew. Was there a human-built structure here once? Remnants of an ancient civilization? No. Believe it or not, these are naturally formed by the lava that once made up this place, some 100 millions years ago. 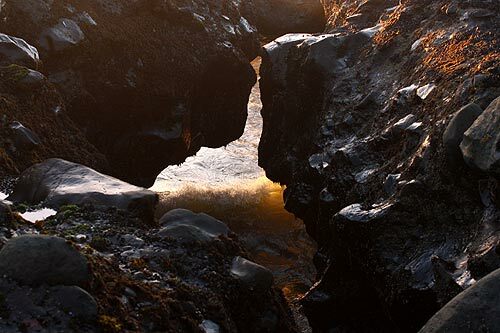 It happens when lava cools a certain way, cracks, and then another eruption forces more lava into the holes. 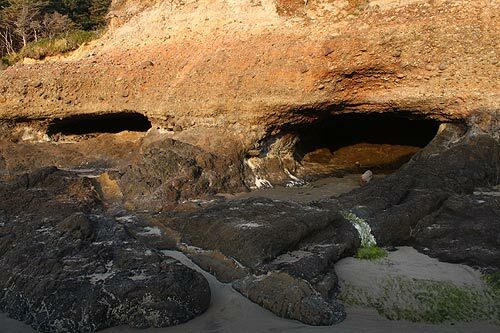 More on the geology of what is called cordwood joints of the Oregon coast. 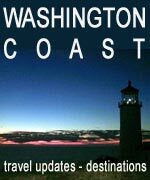 These are also found several other spots along the coast, including Depoe Bay's North Point and another beach just north of Strawberry Hill called Neptune State Park. Speaking of Neptune, an unmarked access that is part of the park hosts a fascinating secret. 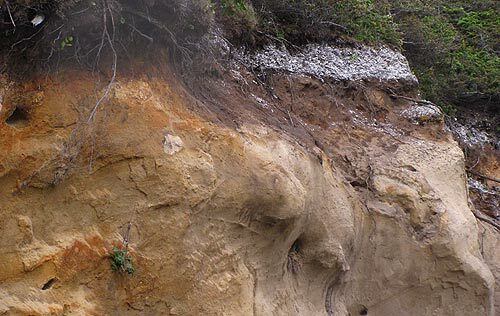 Look closely at the soft soil cliffs here and you'll notice these layers of white. These are shell middens: essentially the garbage piles of ancient native tribes after they got rid of the seafood they consumed. These are hundreds to maybe even thousands of years old, depending on the midden. 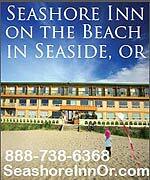 You'll find them in numerous places around this part of Lane County beaches, including Bob Creek. 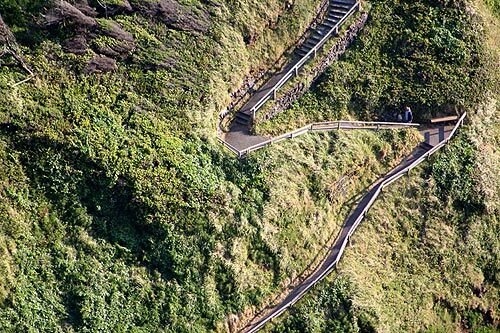 A bit further north, just into Lincoln County, Cape Perpetua soars 700 feet into the air, and the top provides unbelievable viewpoints and vistas. One of the sights here is a unique perspective on the long walkway going down to the Devil's Churn – which many of you have undoubtedly done. From here, you can clearly see the layout and how far you've actually gone. It looks more daunting than it really is. In Yachats itself, there are half a dozen spectacular wave action spots of the spouting horn variety – both big and small. But the real delights can be the details here. 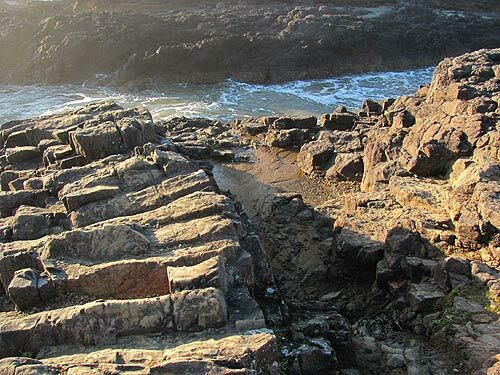 At Yachats State Recreational Area – the main access most are familiar with – the holes in the basalt rocks can be mesmerizing. Though often small and subtle, they are worth looking at closely, such as here, where you see the tide wandering beneath and the sun hitting it just right to made the water glow under there.